The horrific hurricanes and tropical storms of 2017 impacted and displaced thousands of people. As a company, we worked with local contractors and agencies to support rebuilding efforts in the affected areas. Storms like these, tragic as they are, teach us about building science and help us to find better ways to make structures stronger and more wind resistant. Despite the pain, we end up learning things that can protect property owners in the future. If you’d like to know more about making your home more storm resistant, we are dedicating this newsletter to the things that are important to consider when it comes to roofing. The roofing material itself, of course, plays a big role in the wind resistance of the overall roof system. Certain roofing materials are more “resilient” than others, meaning that they flex and are less likely to break or rip under pressure or even when struck by flying debris. Winds exert tremendous forces on a roof, and there are a variety of tests, usually based on the roofing material, to determine a product’s ability to withstand these pressures. Plastic Bags and Wind Tests? The common uplift test performed on metal roofing is generically referred to as the “airbag test.” In this test, a sample deck is roofed but, before the roofing is applied, plastic bagging is put down. During the test, the plastic bagging is filled with air that attempts to push the metal roof panels away from or off of the roof deck. This is done in an attempt to duplicate the uplift pressures created by actual wind events. The air pressures are measured and equated back to coordinating wind speeds. The test is usually cycled with varying amounts of pressure. The roof deck is the lumber (oftentimes plywood) that is between the rafters and the roofing material. There is usually an underlayment material applied to the top of it before the roofing is installed. The roof deck is the primary point of attachment and support for the roofing material. The result of this test is that the panels flex and bow when pressure is applied, returning to normal shape when the pressure is lessened. If the pressure is increased to the point of failure, the typical failure is that the metal distorts enough that panels disengage from each other or the roof and the entire system is compromised. Interestingly, the typical failure in these tests is not due to fasteners pulling out of the roof deck. One benefit that many metal roofs have that is not duplicated by these uplift tests is their air permeability. Pressurized air can pass through metal roof systems so that the complete uplift pressures are not felt by the panels themselves. 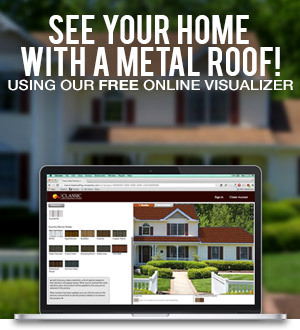 This leads many experts to believe that metal roofs may perform better in real life situations than they do in laboratory tests. As a consumer, you can request and look at wind test results for the various roofing products that you consider. 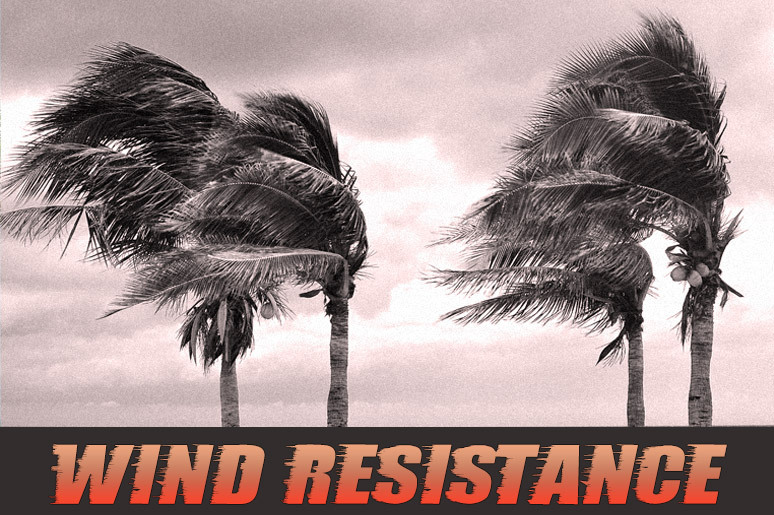 A “common sense” way to look at wind resistance of any roofing material pertains to how the panels connect to one another. Are they held together by sealants? If so, how failure-prone are those sealants over time? Are the panels held together just by sheer weight and gravity, such as with many tile roof systems? Do the adjoining panels actually interlock with one another? How do the mechanical fasteners for the system work? Where are they located? How well do the fasteners support the roof system when it is under uplift pressures? The construction of the actual structure also has a bearing on roof system performance. If under the duress of severe winds, the structure is moving a great deal, it can be easy for the roof system to be jeopardized by that movement, and to eventually fail. While structural stability and movement can go all the way down to foundation deficiencies, there are also things in the attic that have an impact. For example, if an attic has a great deal of intake ventilation but insufficient attic ventilation, then pressures in the attic can cause the roof decking to move or even separate from the rafters and framing. High attic pressures can also cause the structure’s ceilings to collapse, dropping drywall, insulation, wiring, and other home components into the living space. Studies of hurricanes have led to the requirement of more secure fastening and strapping of roof decks to be done in hurricane-prone areas, and we see benefits to that after major storms. Though, again, improper attic ventilation can then cause pressures to build in the attic resulting in collapsed ceilings as the ceilings can now be far less strong than the roof deck. Roof fasteners also play a major role in performance and will be dictated by any roofing material’s wind uplift evaluative tests. While fasteners are just one component of the overall system, those folks in wind-prone areas want to make sure that their roof is installed with the same (or superior) fasteners that were used in testing of the roof system. Proper roof installation is critical. Higher profile roofing materials such as many metal and tile roofs, if not installed properly, can have major gaps and openings where the wind can rush in, creating more pressure behind the panel than the overall air permeability of the roof system can accommodate. Likewise, improper flashings or poorly fastened trims can become issues as well. It is critical, therefore, to hire a contractor whose installation crew is experienced, proven, and accomplished with the roof system being installed. We advise talking to past customers and visiting previous jobs they have installed. For extra help in choosing a contractor, remember our 44 Questions To Ask Your Roofing Contractor. If you are in a high wind area, there may be special installation procedures required by local building codes. Make sure that your contractor is properly licensed and insured and pulling all appropriate permits as well as adhering to all applicable building code requirements. Our experience after wind events has shown other factors that contribute to the performance of roof systems. The age of the roof can be a major factor because age affects the resiliency of many roofing materials. While we generally see metal roof systems retaining their strength over time, many other products dry out or crack or weaken in ways that make them far more prone to wind damage over time. Blowing debris can also be a bane to the success of many roofs in severe storms. If your neighbor’s roof comes off and bounces across your roof, your roof will be compromised if not destroyed. The same goes for things like gas grills and patio furniture. In order to protect your roof, make sure that any loose items in your yard are brought in, secured, or perhaps sunk in the swimming pool if you have one. Finally, wind direction can play a role. This surprises many people but most roof damages occur on the back side of the roof rather than the side of the roof that faces the wind. This is because, as the wind swirls over the home, it creates a vacuum that leads to tremendous uplift pressures on the other side of the roof. Hip roof designs can play some role in reducing this effect. Also, with some roof systems, certain trims can be “directional” so you will want those installed in the way that is least obtrusive to predominant winds. RICOWI is the Roofing Industry Committee on Weather Issues. This organization mobilizes for field investigations after major wind and hail events, to help analyze how various roofing materials performed and arrive at suggestions for possible design or installation changes. Their website includes reports from previous field investigations. The IBHS Research Facility is operated by the Insurance Institute for Business and Home Safety. This organization is committed to creating better building practices that resist damage during weather events and natural disasters such as hurricanes, tornadoes, wildfires, and hailstorms.